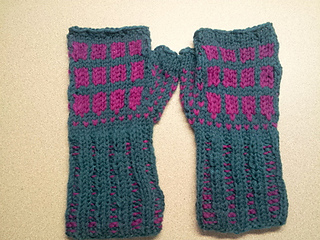 The original mitts used 100 yards of the main color and 40 yards of the contrast color. They’re perfect for leftovers. This design reminds me of the windows in Georgian Terrace Rowhouses. The father son architectural teams of Woods and Dance used them a lot -- and the Dances made them popular in Dublin. If you look up images for Dublin Windows, you’ll see a lot like these. 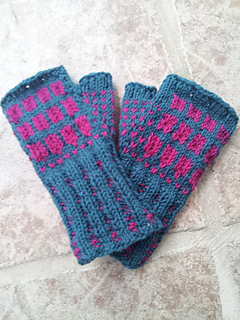 I used leftover yarns from a previous project. 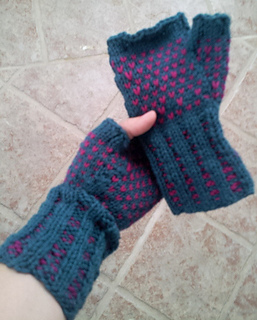 I had about 30yds in Dahlia remaining when I started, and about 123 yds in Teal. I used every scrap of the Dahlia, but had about 25 yards of teal left at the end. To make this work, I had to employ some fancy footwork to get the best use of every inch of the Dahlia -- so the pattern will include a tutorial on doing just that. 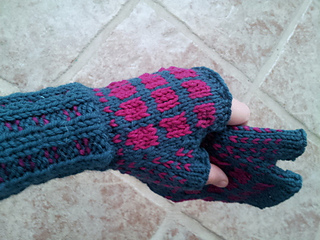 The mitts feature a geometrical design of stacked rectangles that form a square on the back of the hand. 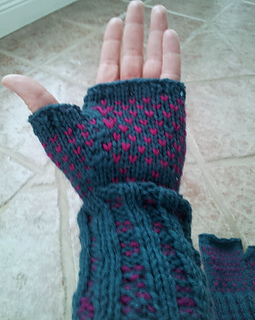 The colorwork on the thumb forms straight lines, while the palm forms a trellis of triangles. 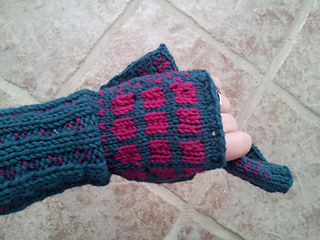 The mitts are stranded starting with a corrugated 2x2 rib.